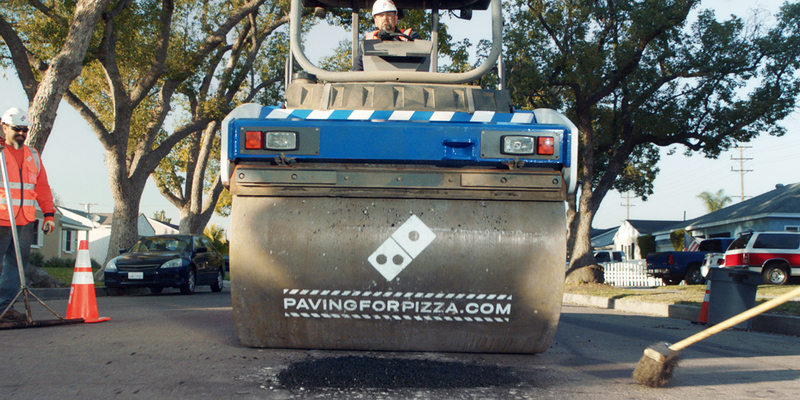 You can use a website to request Domino's help fix a pothole in your area. When you’ve got a pizza in the passenger seat, just about any disruption during your drive could spell disaster for your dinner. Domino’s previously addressed this issue by launching Carryout Insurance, which offers to replace your pizza if it’s damaged between their store and your mouth. But now the pizza chain is getting out in front of the problem, and making a lot of non-pizza-carrying drivers happy in the process. The Domino’s “Paving for Pizza” project has already fixed more than 50 potholes, and it’s only officially launching today. The first cities to receive and accept the offer were Burbank, California; Milford, Delaware; Bartonville, Texas; and Athens, Georgia. You can request for potholes to be fixed in your town via the campaign website, where you’ll also see a fun visualization of how much damage a pizza suffers during different levels of hazardous road conditions. Initial response from residents of the community has been positive, according to the creative team.